CiderCon is an annual shindig organised by the United States Association of Cider Makers (USACM) in the USA. This year it is taking place in the Windy City, Chicago. So, what’s a small Irish cider maker doing over here? Well, I was told it was a place to learn, be inspired, network and meet the great, the good and the various of the US and international cider scene. I received a generous invitation from the current president of the USACM, Paul Vander Heide to visit his bailiwick in Grand Rapids, Michigan which sits on the opposite side of Lake Michigan from Chicago. When I made it to Grand Rapids I met Jason Lummen, the founder and owner of the People’s Cider Company. His mother is a Hanrahan, those late of Galway who departed our shores in the early 1900s. Other than being a thoroughly nice guy he makes some truly great cider. I had the good fortune to visit his cidery and taste some exceptional blends. 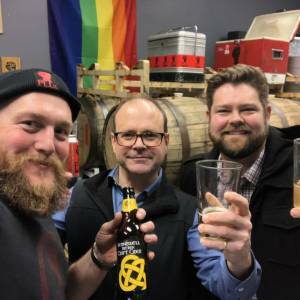 Jason works a lot with wood in the form of old bourbon barrels and succeeds in producing some really well-rounded cider with intricate flavours that embrace the palate. Cider makers united! At the People’s Cider Company. Jason Lummen, myself, Paul Vander Heide. Once joined by Paul we headed over to the nearby Vandermill Cidery. A very impressive production facility currently producing 1.2m litres of cider per annum. The cidery also has a restaurant attached with 10+ different ciders to taste. Paul and his delightful wife Amanda have built Vandermill from scratch into a highly professional and polished outfit and along the way created some really funky and innovative ciders. We then moved onto Jason’s tasting room in downtown Grand Rapids where I was pleased to see a large proportion of the patrons were female. By good fortune Jason’s place is alongside a micro-distillery and micro-brewer so we had the ability to enjoy a variety of excellent libations throughout the evening. Day two, after a quick brunch with the ever-generous Paul and his family at the famous Founders’ brewery, we headed out into the countryside. I was told that Washington was the state which made up the Lion’s share of US apple production and what happened in Michigan was small beer. That notion was put to rest when I met Dan Dietrich, a 6th generation German who cultivates over 15,000 acres of apple trees. This is a serious no nonsense and highly professional approach to farming. They also own their own apple grading facility which uses some of the latest technology, photo imagery and infrared to automate the grading and sorting of fruit. 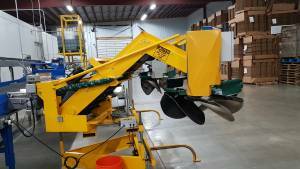 They have a full-time staff of 50 and at harvest time that increases by another 200; all 1,500 acres are harvested by hand. I was blown away. 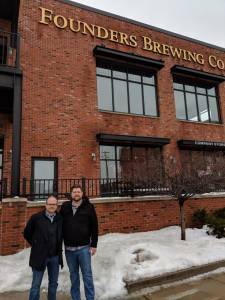 Paul Vander Heide and I outside the Founders Brewery in Grand Rapids MI. Anybody guess what this is? It’s a device which will gently drop apples into an apple bin. We followed on with a visit to Pux cider. Set on a farm bought by the Schaefer family near Conklin Michigan in the 1850’s. Chris, Andy and Mark are the creative genius’ behind this creation, all related, they produce oaked cider, fruit ciders and also some heritage (bittersweet ciders) They have been in operation for 5 years, a tidy little set up in a former cold apple store. The tasting room has a really eclectic mix of paraphernalia from an upright self-playing piano from the great Pantland Hotel, to church pews but most of all a very welcoming tasting bar. We spent a very pleasant moment tasting first rate ciders and swapping stories. There’s no doubt these guys are going places and I wish them well. It’s fair to say that even before CiderCon’s commencement I have already learnt a great deal thanks to the generosity and time from all the people that I met in Michigan. It’s down to Chicago for the main event now. I’ll need to get my sleep if the old grey matter is going to be able to absorb all of the information I’m going to come across.